Did you know that you can make older programs run in Windows Vista? Many programs are designed to run on a specific version of Windows. When you upgrade to a different version of Windows, those older programs can refuse to run. Most of the time, you’ll update to new versions of a program when you update your Windows environment. But if you have an older program that you still want to use, you can run the program using Vista’s secret Compatibility mode, which tricks programs into thinking that they’re running under their favorite older version of Windows. Right-click the program’s icon and choose Properties. When the Properties dialog box appears, click the Compatibility tab. 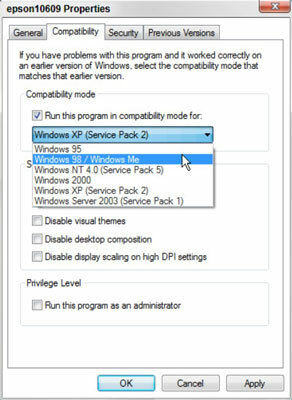 Select the program’s desired Windows version from the Compatibility mode’s drop-down menu. Check your program’s box or look at its manual to see what version of Windows it expects. Click OK and then try running your program again to see if it’s working better. This trick will work for most older programs, but there are always exceptions — programs that just refuse to accept their new home in Vista. If that’s the case, you’ll just have to upgrade.